Trapezius strain happens when muscles in your upper back or neck get stretched, pulled, or torn. Your trapezius muscles are located on either side of your spine and start from the middle of your back and reach up to the top of your neck. Your trapezius (sometimes called “traps”) connect to your shoulder blade and support the weight of your arm. Strained trapezius muscle can happen by sudden jerking movements, lifting heavy items, not warming up before exercising, or playing certain sports. When trapezius muscles tear, get strained, or are injured, the symptroms will be sharp pain in your upper middle back and possibly your neck (trapezius pain). This can result in pain when moving your arms, throwing objects, or trying to work with your arms above your head. You may also suffer from swollen trapezius if the strain or muscle tear has been severe. Treating pulled, torn, and painful trapezius muscle usually involves resting the strained muscle and applying ice or heat. After the initial trapezius strain and when the muscle begins to heal, massaging pain-relieving essential oils and exercising to strengthen your back muscles can help to speed up recovery time. Because your trapezius muscle controls and supports your arm and shoulder movements, strains to the trapezius are very common. The sore trapezius muscles can make it difficult to turn your head or move your neck without pain. You could also find that if you are under stress, your “traps” tighten and it could feel like you have strained your trapezius muscles. Usually, a tight and sore upper back is the most common symptom of inflamed or strained trapezius muscles. The tension in your upper back can cause a lot of pain and discomfort and can negatively impact on your daily activities. Doctors from the Mayo Clinic say that muscle strains cause swelling and muscle spasms and may affect the range of motion in your left arm or right arm, depending on which trapezius muscle was strained.2 Depending which part of the trapezius muscles was strained, you might have an aching burning feeling in the back of your neck from your skull to your shoulder blades. The area around the shoulder could become very tender to touch and feel like you have knots in your shoulders due to tension in the muscles. Let’s look at the main causes of trapezius strains and tears. Knowing what can injure the muscles at the top of your back between your shoulder blades can also help you know how to prevent suffering a trapezius muscle strain. One of the most common reasons for developing symptoms of trapezius muscle pain is due to repetitive actions. This often occurs if you have to sit for long periods of time at a desk or computer. The result of repetitive strain is overuse of the trapezius muscles that can cause inflammation, knots in your shoulder, and chronic pain. You can easily pull trapezius muscles and cause upper back pain if you carry heavy items in an awkward position. You could also tear or injure your “traps” if you don’t lift heavy items properly. Failing to warm up properly before exercising can result in a trapezius injury. If muscles and ligaments are put under too much pressure without warming up, you can easily tear trapezius muscles. Age can also affect the flexibility and strength of your muscles and ligaments. Therefore, if you are an older person, light stretching and gentle exercising in the mornings can help warm up muscle groups and prevent unnecessary strains and muscle pain. Certain sports that involve throwing, rowing, or hitting with a bat can strain and tear trapezius muscles. Muscle strain of the trapezius can happen without warning if you throw an object with a forceful, jerking motion. Poor posture when sitting or standing can result in trapezius muscle strain that causes tension, stiffness, and pain in the upper middle back and neck. If you sit at a desk all day, then sitting properly is important to prevent trapezius pain and tension in your upper back and shoulders. Doctors from the NHS say that sitting for long periods can cause a flat back that leads to muscle imbalances. This puts more strain on your trapezius and other upper back and neck muscles. Doctors recommend taking steps to correct your posture to help ease tension in your back and relieve the symptoms of trapezius strain. When you are under stress, your trapezius muscles are usually the first ones to bother you. Stress causes muscle tension and can even increase your risk of pulling or damaging your muscles, including your trapezius. If you find that stress is causing your back muscles to become sore and tense, then why not try some of my natural remedies for getting rid of anxiety? Holding a baby during breastfeeding can put extra strain on your trapezius and cause knots in your shoulder muscles. There are a number of factors that cause trapezius strain while feeding a baby. First, holding your baby for a long time can strain your upper back muscles. Second, keeping your head or neck in a fixed position can strain the trapezius in your neck and give you a stiff neck. You can avoid straining your trapezius while breastfeeding by laying down on your side if possible or sitting with a pillow on your lap to rest your baby. With proper care at home, you can easily treat symptoms of trapezius strain. Here are some of the most effective ways to heal strained and torn trapezius muscles to get rid of trapezius pain. As soon as possible after tearing, straining, or pulling a trapezius muscle, put ice on it to prevent swelling and inflammation. An ice pack helps to numb the pain and also prevent nerve irritation causing discomfort. Put crushed ice cubes in a sealable plastic bag and wrap in a clean towel (ice should never be placed directly on the skin). Hold the ice pack to the strained trapezius for 10-15 minutes to relieve trapezius muscle pain. Apply every hour for the first day and then every 3-4 hours on the second day. On the third day, if you still have trapezius pain you should apply heat to continue the healing process. A combination of Rest, Ice, Compression, and Elevation (or, the RICE method) can help to alleviate the pain of damaged muscles in your upper back. RICE will also help to prevent further injury to your trapezius muscles. Rest the strained trapezius muscle by avoiding any activity that puts a strain on shoulder muscle. Ice the sore trapezius muscle between your shoulders by making a cold pack. Compress the affected muscles with an elastic bandage to restrict movement and reduce swelling. Elevate your body as much as possible by sitting up so that your shoulders are always above the level of your heart. If you have severe pain in your trapezius muscles from a muscle strain or muscle tension, then applying a moist heat pack can relieve shoulder pain. Heat helps to increase blood flow to the affected area to promote soft tissue healing in your upper back. Fill a clean sock or small pouch with rice and tie it shut. Place the rice-filled pack in a microwave and heat on full power for 2 minutes. Make a moist heat pack by dipping a washcloth in hot water and wrapping the heat pack in the dampened washcloth. Apply the heat pack to the pulled trapezius for 10-15 minutes every 3 or 4 hours. Use every day until all trapezius pain and muscle soreness from your shoulder and neck has gone for good. One way to relax tense muscles and also relax your mind to ease muscle tension is to take a warm bath of Epsom salt. Fill your bathtub with very warm (but not hot) water and add 1 to 2 cups Epsom salts. Soak in the bath water for 20 minutes to allow the salts and minerals ease your muscle tension. Rinse off in the shower and dry yourself. Take the bath up to three times per week until your sore trapezius muscles are healed and are no longer sore. A massage with essential oils can help get a knot out of your shoulder muscles and relieve trapezius pain. There are many essential oils with pain relieving properties that are great for getting rid of soreness from strained muscles. Also, the massage technique improves blood flow to the pulled trapezius to help boost healing time. Mix 10-12 drops of peppermint oil, rosemary oil, or lavender oil with 1 oz. carrier oil such as sweet almond oil. Apply a little of the massage oil remedy to your sore trapezius muscle in your upper back and neck area and gently massage in circular movements. Apply the massage oil 2 times a day making sure that it all gets absorbed into your skin. Use every day to relieve trapezius muscle stiffness and knots and continue until you no longer have muscle pain. Improving your posture is important not to just prevent trapezius strain, but also help speed up the healing process. When sitting, your head should be upright with your shoulder back. You should be able to put your hand through the gap at your lower back. When standing, good posture involves standing with your knees straight and your feet at shoulder width. For helpful advice on how to improve your posture and prevent upper, middle, lower left back pain, or lower right back pain, please read my article on the best exercises for improving posture. To help trapezius strains heal quicker and prevent them recurring, there are many effective exercises to strengthen your back and prevent upper back pain. Here are 5 easy exercises to strengthen and flex your trapezius muscles you can do while sitting at your desk. Shoulder blade pinches. Squeeze your shoulder blades together and hold for 10 seconds. Repeat 15 times. Shoulder shrugs. Raise your shoulders in a shrugging motion, hold, then relax them. Repeat 15-20 times. Neck stretches. Tilt your head to one side to try and touch your ear to your shoulder. Repeat with the other side and do the exercise 10 times. Neck rotation. Move your head to one side so that your nose is parallel with your shoulders. Repeat the movement looking to the other direction. Do the exercise 15 times. Neck rotation and stretching. Place your right hand on your head with your left arm at your side. Then gently pull your head towards your right shoulder. Rotate your head to look at your right hip. Repeat on the opposite side with your other hand. Repeat 10 times. You have no strength in your arm. 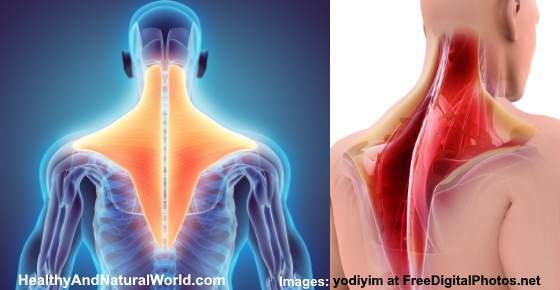 The injured area between your shoulder blades is cool, pale, or changes color. You have numbness and tingling in your back or arm. Pain in the neck or between your shoulders becomes increasingly severe and home remedies don’t relieve the discomfort. You need advice on how to go about your daily activities while the trapezius injury is healing. MayoClinic. Sprains and strains. Symptoms. MayoClinic. Sprains and strains. Causes. J Neurol Neurosurg Psychiatry. 1991 Jun; 54(6): 561. Scand J Rehabil Med.1993 Sep;25(3):131-7. URMC. Common injuries of the shoulder. OrthoInfo. Shoulder injuries in the throwing athlete. NHS. Common posture mistakes and how to fix them. WorksafeQLD. The link between stress and muscle strain. Curr Rev Musculoskelet Med. 2015 Jun; 8(2): 162–167.